Kerem Running Peulot at Camp! Since we last spoke, we’ve been very busy. Thursday afternoon had a great פעולה where we discussed Israel, and then spent a lot of the afternoon preparing for the evening. We then had ערב balloon where we had different stations with balloons. Some of the stations included sumo wrestling with balloons and balloon tennis where we had to try to keep the balloon from touching the ground with tennis rackets. We then surprised one of our ראשי עדה, Dani, with a celebration of all her hard work by organizing a surprise bonfire for her and speaking about all the great things she’s done for us. We continued the night with lots of snacks and a dance party under the pavilion. We had a great time covering our bunks on Friday afternoon and getting to know our חניכים (campers) even better, followed by play practice and preparations for Shabbat. Shabbat was filled with lots of רוח and meaning, although also a very cold day. We had our own Kerem מנין during the morning תפילות, where we had a מחיצה with three sections. In the afternoon, we had a discussion led by Robert Wexler about his organization’s view on how to solve the Israeli-Palestinian conflict. It was a very informative discussion and it was particularly interesting to see the spectrum of opinions our עדה has. We had a lot of fun covering our bunks Saturday night, putting our חניכים to sleep and experiencing some of the challenges of being a madrich. Sunday was another very cold day. In the morning we covered our חניכים for breakfast and נקיון (bunk clean up), making sure that they cleaned their bunks as well as we do. 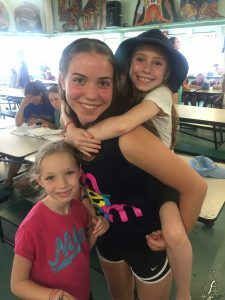 Sunday was Yavneh-for-a-day, where many families toured camp to see how great Yavneh is. In the afternoon we split up into committees for Zimriyah and our counselors surprised us with cookies and frosting for all of our hard work. We spent a lot of time in the afternoon planning and preparing our פעולות for the evenings. The Kerem for Ma’alot ran Ma’alot’s Next Top Model, where each חניך was assigned to a group with a theme and had to dress up according to that theme. The Kerem for Levi’im ran an ערב Sumo where people wore big shirts with balloons underneath and tried to pop their opponent’s balloon while keeping theirs intact. Arayot בנות ran a dance off פעולה that was also a lot of fun, and Gurim ran a movie themed פעולה in addition to a scavenger hunt-capture the flag. K’firim בנות (girls) had an ערב spy where the חניכות dressed in all black and played spy related games. All of the פעולות were a big hit and all of our חניכים had tons of fun. We then debriefed how our activities had gone with Lisa and our מדריכים, getting feedback and ideas for ways to improve our planning in the future. We finished off the day with a barbeque by the boy’s bunk, and are looking forward to our white water rafting trip this week!